At least once a month, the Rev. C.S. Oosterveen puts on his holster, heads west to Plymouth Township and becomes a cowboy known as the Rev. Missalot, for about four hours. “I come here for the camaraderie and to have a good time,” said Oosterveen, a Roseville resident. 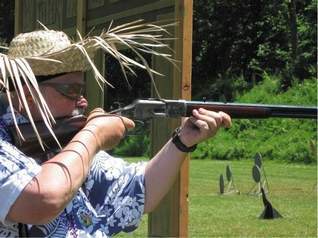 Taking part in the Cowboy Action Shooting at the Western Wayne County Conservation Association on Napier is a welcome break from the pressures of his job.